The photo challenge this week is to explore the classical elements of earth, air, water, and fire. Difficult to get all the elements in a single shot of course, so MB will give followers a few of the recent shots he took around the square in front of the chateaux in the town of Nyon, Switzerland. The shots contain elements of the elements! Some weather thingy on a wall in the square. The inscription below the weather clock reads – He who looks at me loses time – or some such. French attempt at humour or wisdom, MB presumes. After 6 months – that was the sum total of JL’s French!!! Anyway, a few weeks back, MB found himself in Nyon, a small French-speaking town some 15 minutes train-journey from Geneva. MB had heard that there was a castle on the outskirts of the town, on the lake edge, that was worth a visit and a few camera shots. “Parlez vous Anglais?” said MB to a couple of shop assistants, a few minutes after disembarking from le train. “Mais oui Monsieur” replied les deux Francais. And just at that precise moment, all of MB’s school French came flooding back to him. Like un tres grande linguistic sunami, en Francais. “où est le chateaux?” said MB, casually, to les deux Francais, who looked quizzically at l’Irelandais, wondering if this guy before their eyes wasn’t some kind of major p**s taker. He had just asked them if they spoke English and had then addressed them in perfect Francais. ‘Quell assh**e’ they were thinking for sure, thought MB. “à droite Monsieur” – instructed les deux Francois. “Merci beaucoup, merci beaucoup, au revoir” replied MB in accent-perfect Francais. “Un plaisir (assh**e)” replied les deux Francais. MB turned right just down the street as instructed. What satisfaction did MB not feel on seeing le beau chateaux before his eyes, a mere 100m in the distance. All as a result of MB’s tres bon multilingual skill-set! There is a castle and pub next to a river bridge on the road between Shannon Airport and Limerick City in the west of Ireland at a village called Bunratty. The castle takes it’s name from the village – Bunratty Castle, where you can book into one of the castle banquets that take place there most nights during the tourist season as far as MB is aware. The pub is one of Ireland’s oldest at almost 400 years old and has the great name of Durty Nelly’s. If you want to check out who Durty Nelly actually was, you can read it on the pub’s website She was certainly a character. Even amongst natives, the pub is renowned for the quality of the Guinness beer served within. A number of years back, MB and English friend Pete, who liked his Guinness in the pubs of London, stopped off for a tipple having landed at Shannon Airport only a short while before. “Well Pete, how do you like our Irish Guinness served in Durty Nelly’s” enquired MB, Pete having taken a swallow that made almost half the contents of the pint glass disappear on the occasion of his first visit to Ireland. Pete closed his eyes, leaned back on his bar stool and uttered the immortal reply -“It’s like strawberries and cream on a summer’s day MB”. And so it was. 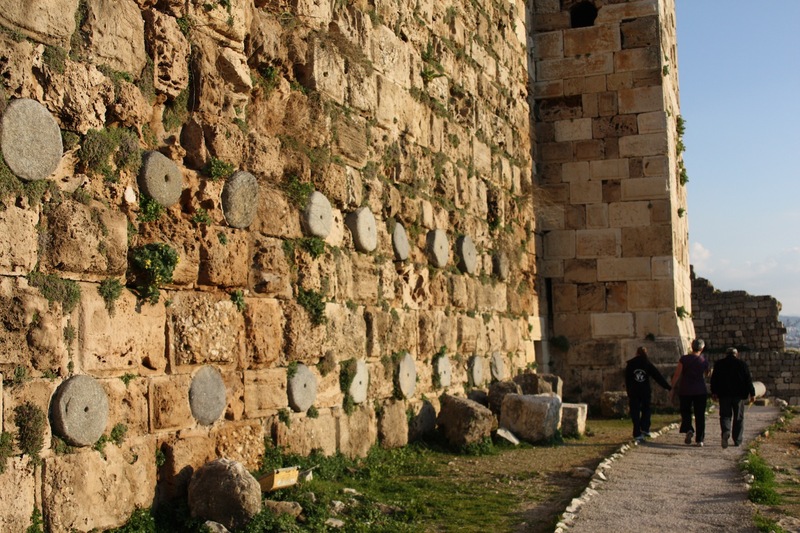 The walls of the 12th century Crusader castle at Byblos, Lebanon. Byblos is considered the oldest continuously inhabited city/town in the world (at approx 8,000 years) and was founded by the Phoenicians. The castle walls are decorated with the columns of a former Greek (or Roman?) Temple which was demolished to make way for the castle. 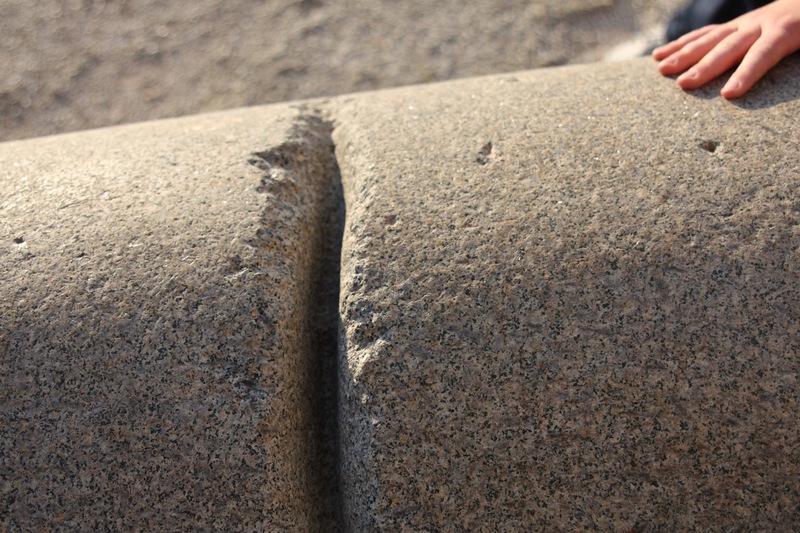 The stone columns of the temple were cut using a rope, water and sand. As shown in the second pic.